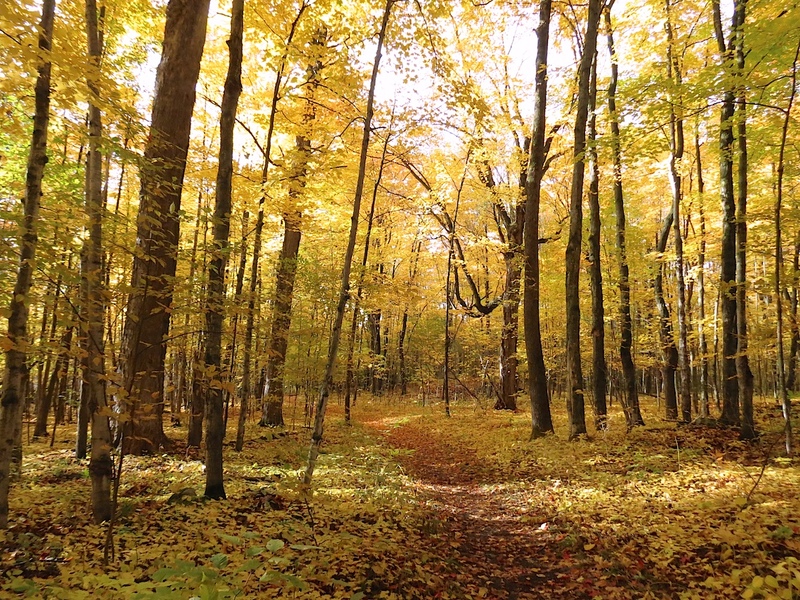 One of the most beautiful, mature woodlands in a natural area owned by the City of Ottawa, Trillium Woods in north Kanata is a Sugar Maple-Beech climax forest that provides an impressive display of trees in all seasons. 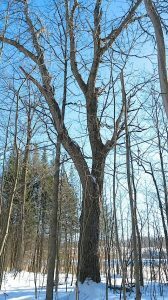 The high canopy offers a cool walk in the summer and showcases the structure of the trees in winter. Good examples abound of mature Bitternut Hickory (Carya cordiformis), Butternut (Juglans cinerea), Eastern Hemlock (Tsuga canadensis), Basswood (Tilia americana), Yellow Birch (Betula alleghaniensis), Black Cherry (Prunus serotina), and Largetooth Aspen (Populas grandidentata). 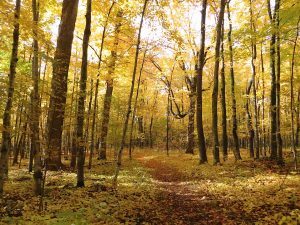 There is also a scattered population of Hornbeam (Carpinus caroliniana) colonies along the trail in damp areas, one near a grove of Balsam Fir (Abies balsam). 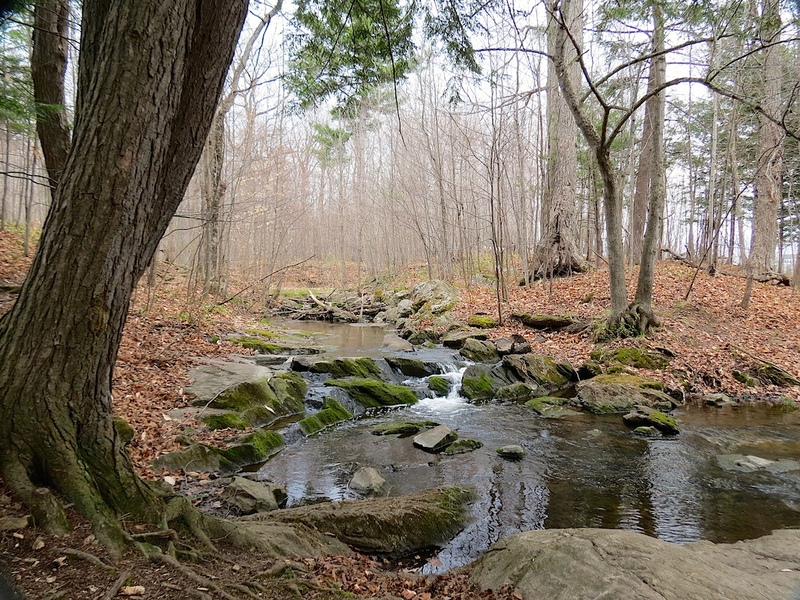 Trillium Woods is near the South March Highlands Conservation Forest, separated by Terry Fox Drive. 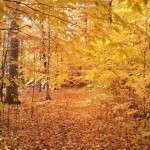 Trillium Woods has many features to delight tree and nature lovers. Refer to the map at the bottom for their locations along the trail. Tall, likely second-growth Sugar Maples with uniform, straight boles line the north section of the trail on the approach to the bridge over Shirley’s Brook. Follow the loop by taking a right turn before the bridge. This section of the path parallels the wetlands and hosts large specimens near the path and in the forest interior. 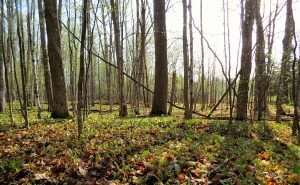 Throughout the site note the large population of Sugar Maple seedlings on the forest floor. Following the drought of 2012 the trees produced a huge crop of seeds in 2013 that became young seedlings in 2014. 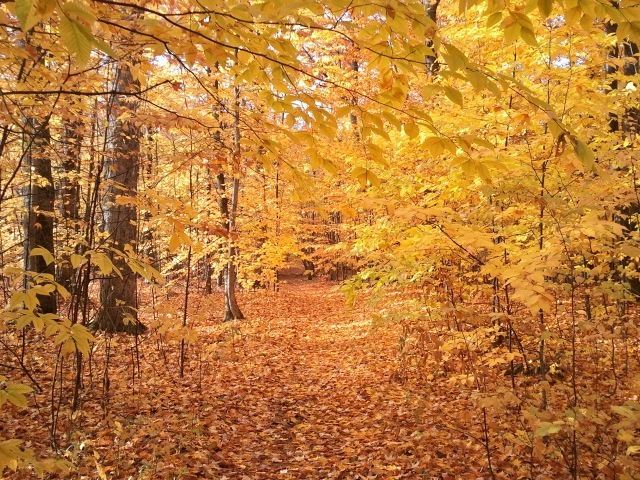 In autumn the forest is a brilliant canopy and carpet of golden leaves. A grove of Eastern Hemlock lies in a hollow near the bridge and frames Shirley’s Brook cascading down the rocky slope. Rock Elms grow on the crown of the rocky ridges although they are in decline likely due to recent droughts in 2012 and 2016. 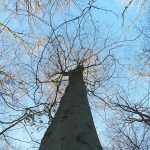 The largest American Beech in the forest grows in the interior on a one-way side path off the loop. Beech grow slowly so the many mature specimens are notable. 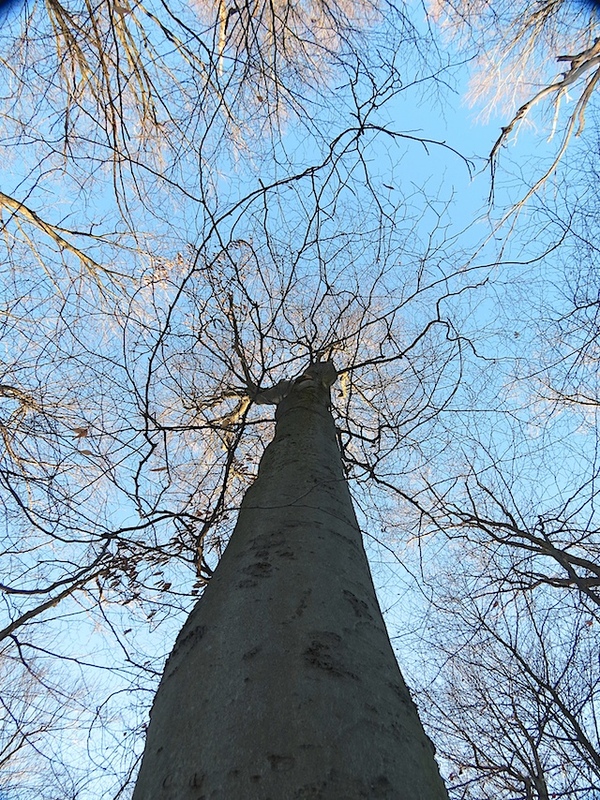 Bitternut Hickories are found throughout the forest, but the largest concentration can be found near the large American Beech. 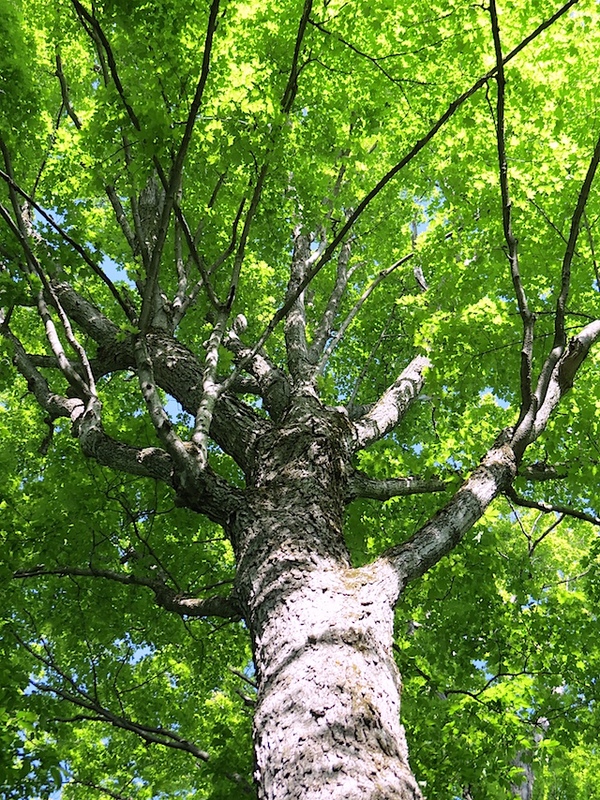 The trunks are tall and straight, rising to reach the light. 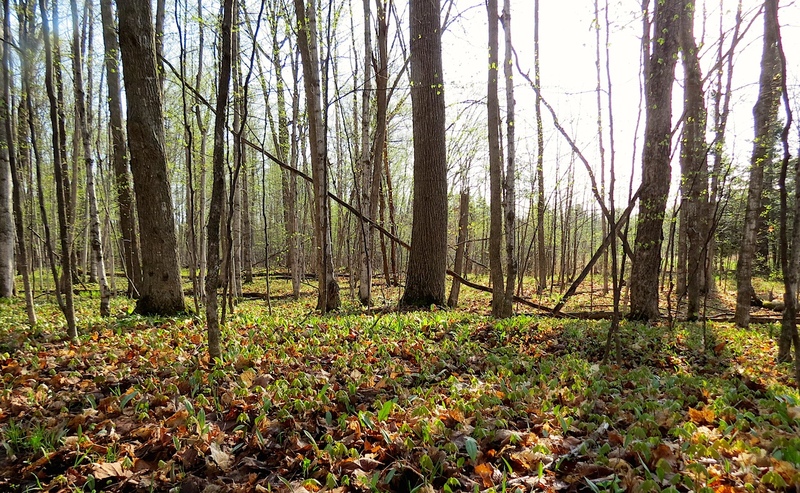 Rich, mesic conditions also support an array of spring ephemerals such as red and white Trilliums, Dutchman’s Breeches, Trout Lily, and Bloodroot. 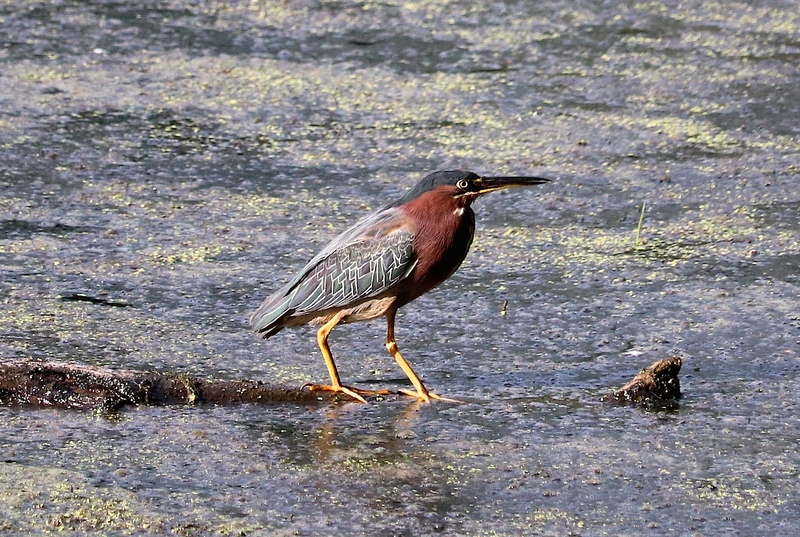 The wetland that feeds Shirley’s Brook provides habitat for Blue Heron, Green Heron, and migrating waterfowl. 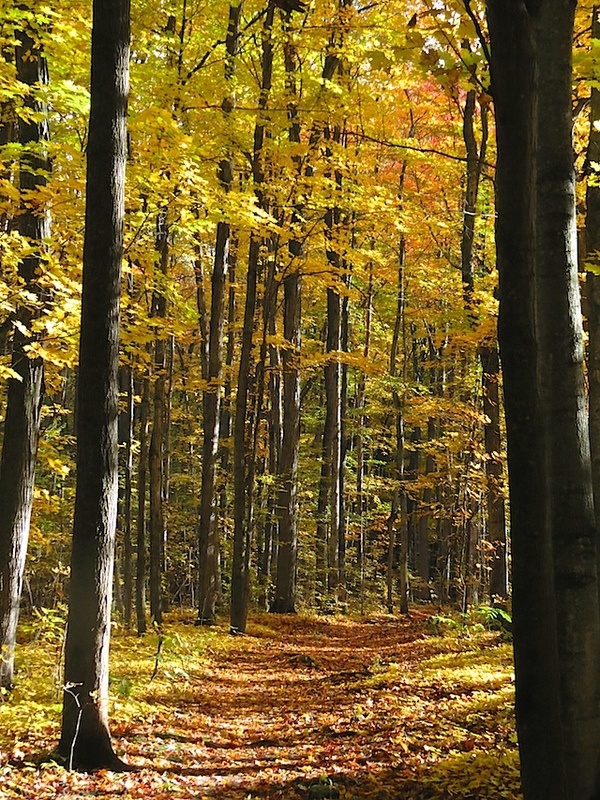 Trillium Woods can be accessed from multiple points, but the best location is at the Richcraft Centre on Innovation Drive. Park there and walk around the back. 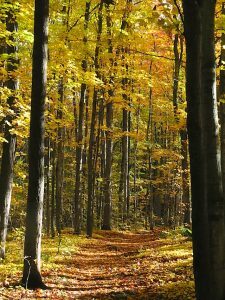 Take the stone dust path into the woods. There is a trail map at the entrance that shows the loop. Goulbourn Forced Road bisects the forest and must be crossed twice to complete the loop. 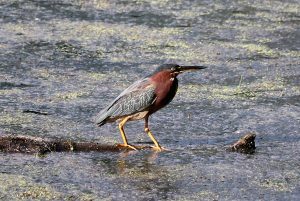 A second access point is on the Blue Heron Trail at Hines Road (near Solandt Road) in the heart of a high tech business park. 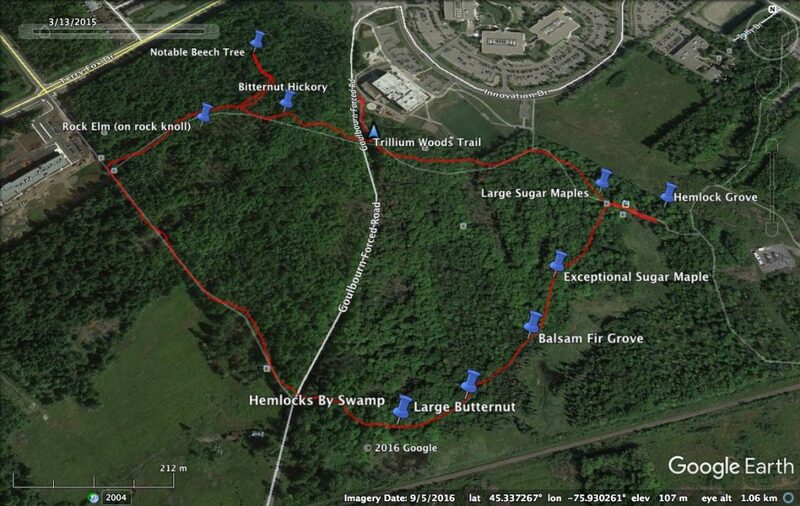 Trail Map for Trillium Woods with some notable trees and areas identified.